The Eurasian lynx (Lynx lynx) is a medium-sized cat native to Siberia, Central, East, and Southern Asia, North, Central and Eastern Europe. It has been listed as Least Concern on the IUCN Red List since 2008 as it is widely distributed, and most populations are considered stable. Eurasian lynx have been re-introduced to several forested mountainous areas in Central and Southeastern Europe; these re-introduced subpopulations are small, less than 200 animals. The Eurasian lynx is the largest lynx species, ranging in length from 80 to 130 cm (31 to 51 in) and standing 60–75 cm (24–30 in) at the shoulder. The tail measures 11 to 24.5 cm (4.3 to 9.6 in) in length. Males usually weigh from 18 to 30 kg (40 to 66 lb) and females weigh 8 to 21 kg (18 to 46 lb). Male lynxes from Siberia, where the species reaches the largest body size, can weigh up to 38 kg (84 lb) or reportedly even 45 kg (99 lb). It has powerful, relatively long legs, with large webbed and furred paws that act like snowshoes. It also possesses a short "bobbed" tail with an all-black tip, black tufts of hair on its ears, and a long grey-and-white ruff. Lynx prey largely on small to fairly large sized mammals and birds. Among the recorded prey items for the species are hares, rabbits, marmots, squirrels, dormice, other rodents, mustelids (such as martens), grouse, red foxes, wild boar, chamois, young moose, roe deer, red deer, reindeer and other ungulates. Although taking on larger prey presents a risk to the animal, the bounty provided by killing them can outweigh the risks. The Eurasian lynx thus prefers fairly large ungulate prey, especially during winter when small prey is less abundant. They are the only Lynx species in which ungulates provide a great portion of their diet in relation to lagomorphs or rodents. Where common, roe deer appear to be the preferred prey species for the lynx. Even where roe deer are quite uncommon, the deer are still quantitatively the favored prey species, though in summer smaller prey and occasional domestic sheep are eaten more regularly. In parts of Finland, introduced white-tailed deer are eaten mostly regularly. In some areas of Poland and Austria, red deer are the preferred prey and, in Switzerland, chamois may be locally favored. They will also feed on carrion when it is available. Adult lynx require 1.1 to 2 kilograms (2.4 to 4.4 lb) of meat per day, and may take several days to fully consume some of their larger prey. Eurasian lynx at the Monte Kristo Estates (zoo) in Hal Farrug, Luqa, Malta. The Eurasian lynx inhabits rugged forested country providing plenty of hideouts and stalking opportunities. Depending on the locality, this may include forest-steppe, boreal forest, and montane forest. In the more mountainous parts of their range, Eurasian lynx will descend into the lowlands in winter, following their prey, and avoiding the deepest snows. They tend to be less common where wolves are abundant, and wolves have been reported to attack and even eat lynx. In Russian forests, the most important predators of the Eurasian lynx are the grey wolf and the wolverine. Wolves kill and eat lynxes that fail to escape into trees. Lynx populations decrease when wolves appear in a region and are likely to take smaller prey where wolves are active. Wolverines are perhaps the most dogged of competitors for kills, often stealing lynx kills. Lynxes tend to actively avoid encounters with wolverines, but may sometimes fight them if defending kittens. Sometimes, Siberian tigers have also preyed on lynxes, as evidenced by examination of tiger stomach contents. Lynx compete for food with the predators described above, and also with the red fox, eagle owls, golden eagles, wild boar (which scavenge from lynx kills), and in the southern part of its range, the snow leopard and leopard as well. Although the Eurasian lynx is not found in Japan, fossils of Eurasian or closely related species from the late Pleistocene era and onward have been excavated from various locations. Central Asia: The Eurasian lynx is native to the Chinese provinces of Xinjiang, Gansu, Qinghai, Sichuan, and Shaanxi, as well as to northern slopes of Iran's Alborz Mountains, Mongolia, Kazakhstan, Uzbekistan, Turkmenistan, Kyrgyzstan, Tajikistan and Afghanistan. India: Kashmir's Ladakh area, Himachal Pradesh and most other Himalayan states. Nepal: Most of northern areas of country. Russia: More than 90% of all Eurasian Lynx live in the forests of Siberia. They are distributed from the western borders of Russia to the Pacific island of Sakhalin. Turkey: Although exact numbers are not known, the Eurasian Lynx are found in most of Turkey's forests but are thought to have been in decline. Various government bodies are responsible for wildlife in Turkey and before 1990, hunting of Lynx was uncontrolled. Since then hunting has been restricted and there are 83 game conservation and breeding areas where hunting is prohibited. This has had a positive effect on their conservation in Turkey. Research carried out in Kars have discovered a new breeding population in Sarıkamış. However, threats from legal and illegal logging as well as illegal poaching exists. Once the Eurasian lynx was quite common in all of Europe. By the middle of the 19th century, it had become extirpated in most countries of Central and Western Europe. There have been successful attempts to reintroduce this lynx to forests. Carpathian Mountains: About 2,800 lynx live in this mountain range in the Czech Republic, Poland, Romania, Slovakia, Bosnia and Herzegovina, and Serbia. It is the largest contiguous Eurasian Lynx population west of the Russian border. Romania: over 2000 lynx live in Romania, including most of the Carpathian population. However, some experts consider these official population numbers to be overestimated. Limited hunting is permitted but the population is stable. Britain: It was thought that the lynx had died out in Britain either about 10,000 years ago, after the ice had retreated, or about 4,000 years ago, during a cooler and wetter climate change. However, carbon dating of lynx bones from caves in Sutherland in the Scottish Highlands and in Craven in North Yorkshire show they still lived in Britain between 80 and 425 AD, with cultural sources suggesting a survival until the medieval period. Old names for the species in the languages of Britain include Lugh (Gaelic), Llew (Welsh) and Lox (Old English). There is interest in reintroducing the lynx to Britain in order to return some natural state of control to deer populations, which have no natural predators left in Britain. A study of the biological feasibility of reintroducing Eurasian lynx to Scotland indicates there is sufficiently abundant prey and well-connected habitat to support a viable population of over 400 animals. Interest in reintroducing the species was further bolstered in 2016 in relation to a successful breeding program for the Iberian lynx in Spain. Czech Republic: In Bohemia, the lynx was exterminated in the 19th century (1830–1890) and in Moravia probably at the turn of the 20th century. After 1945, migration from Slovakia created a small and unstable population in Moravia. In the 1980s, almost 20 specimens were imported from Slovakia and reintroduced in the Šumava area. In early 2006, the population of lynx in the Czech Republic was estimated at 65–105 individuals. Hunting is prohibited, but the lynx is often threatened by poachers. Dinaric Alps and Julian Alps: Slovenia, Croatia, and Bosnia and Herzegovina are home to between 130 and 200 lynx. The Eurasian lynx had been considered extinct in these countries since the beginning of the 20th century. However, a successful reintroduction project was carried out in Slovenia in 1973, when three female and three male lynx from Slovakia were released in the Kočevski forest. Today, lynx can be found in the Slovenian Alps and in the Croatian regions of Gorski kotar and Velebit, spanning the Dinaric Alps and over the Dinara Mountain into western Bosnia and Herzegovina. Croatia's Plitvice Lakes National Park is home to several pairs of lynx. In the three countries, the Eurasian lynx is listed as an endangered species and protected by law. Realistic population estimates are 40 lynx in Slovenia, 40–60 in Croatia, and more than 50 in Bosnia and Herzegovina. The Croatian massif Risnjak in Risnjak National Park probably got its name from the Croatian word for lynx, ris. Estonia: There are 900 individuals in Estonia according to a 2001 estimate. Although 180 lynx were legally hunted in Estonia in 2010, the country still has the highest known density of the species in Europe. Fennoscandia: Fennoscandian lynx were close to extinction in the 1930s–1950s but increased again thanks to protection. In the meantime protective hunting for lynx has been legalized again. The numbers are still on a slow increase. Lynx is the only non-domestic feline in Scandinavia. Finland: about 2200–2300 individuals, according to a 2009 estimate. Lynx population in Finland have been increasing every year since 1991, and is estimated to be nowadays larger than ever before. Limited hunting is permitted. In 2009 the Finnish Ministry of Agriculture and Forestry gave a permit for hunting of 340 lynx individuals. Norway: The Eurasian Lynx is found in stable populations throughout Norway except for the southwestern counties, where they are only found sporadically. The national goal of 65 lynx births was reached in 2007, with 69 to 74 registered lynx born. The population was estimated at 409–439 specimens. Sweden: Sweden had an estimated population of about 1400 lynx in 2006 and 1250 in 2011. The hunt is controlled by government agencies. Hunters who wish to hunt for lynx must register for the so-called "protective hunt," which takes place in March. The hunt may only take place if the population has an annual increase of 300 animals. The government has allowed the requirement to fall to an increase of 250 lynx under "certain circumstances" and still permit the hunt. Even though the goal is rarely met, the hunt is always approved. This has led to a steady decrease of the number of lynx in Sweden and protests from larger non-governmental organisations such as the Swedish Society for Nature Conservation. Only a few animals are allowed to be shot in each region, depending on the size of the local lynx population and/or how the reindeer herding is affected. Every shot animal and shooting location is controlled by the County Administration, and the carcass is sent away for analysis to the National Veterinary Institute. The hunter may keep the skin, if a microchip or transponder is attached by the local police authority. The skull of the shot animal can be sent back to the hunter for a fee of about €70. No more than 75 animals in 20 regions were permitted to be shot in 2007, an increase from 51 in 2006 (always about 5% of the population). In 2006 there were 41 lynx killed outside of hunting, 31 of which were killed in traffic accidents. France: The lynx was exterminated in the French Alps in the early 20th century. Following reintroduction of lynx in Switzerland in the 1970s, lynx were recorded again in the French Alps and Jura from the late 1970s onwards. Germany: The Eurasian Lynx was exterminated in Germany in 1850. 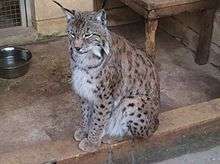 It was reintroduced to the Bavarian Forest and the Harz in the 1990s; other areas were populated by lynx immigrating from neighboring France and the Czech Republic. In 2002 the first birth of wild lynx on German territory was announced, following a litter from a pair of lynx in the Harz National Park. Small populations exist also in Saxon Switzerland, Palatinate Forest, and Fichtelgebirge. Latvia: According to a 2005 estimate, about 700 animals inhabit areas in Courland and Vidzeme. Lithuania: Population is estimated at 80–100 animals. Netherlands: The lynx has been extinct in the Netherlands since the Middle Ages. Although there were some sightings, they probably stem from captive-bred lynx which have escaped or were released to the wild, or may be lynx moving in from Germany, since several of the sightings reported during the 1980s and 1990s were around the Reichswald area. Belgium: The lynx was extinct for about 300 years, but started to recolonize the eastern part of the country in the first decade of the 21st century (around Vielsalm and Voeren). These animals are probably individuals from the lynx populations in the Eifel region of Germany or the Vosges region of France, or possibly also illegal introductions by hunters. Poland: The Mammal Research Institute of the Polish Academy of Sciences has information about "at least 128 lynx", observed in 2006/2007. The report suggests that the number is underestimated. 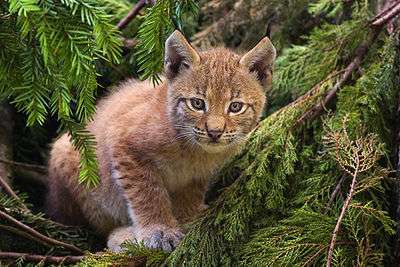 Slovakia: The lynx is native to forested areas in Central and East Slovakia. 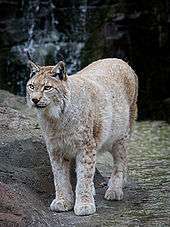 The lynx in Slovakia live mainly in mixed forests at altitudes from 800 to 1000 m. The feline can also be found in many national parks of Slovakia and other protected areas. Switzerland: The lynx became extinct here in 1915, but was reintroduced in the 1970s. Swiss lynx also migrated to Austria, where they had also been exterminated. A higher proportion are killed by human causes than by infectious diseases. 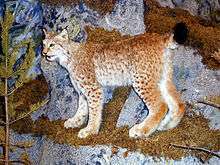 Italy: The Lynx was considered extinct since the early 20th century but over the past 30 years a partial recolonization of the Alps, from the Swiss and Slovenian populations, is occurring. Claims in 2009 of the existence of a very small population in central Italy proved to be unsubstantiated. 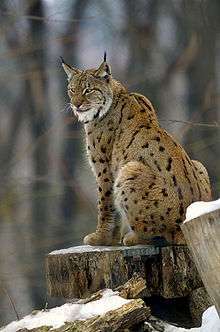 Ukraine: The lynx is native to forested areas of the country. Before the 19th century it was common also in the Forest steppe zone. Nowadays, the most significant populations remain in the Carpathian mountains and across the forests of Polesia. The population is estimated as 80–90 animals for the Polesia region and 350–400 for the forests of the Carpathians. ↑ Wozencraft, W.C. (2005). "Order Carnivora". In Wilson, D.E. ; Reeder, D.M. Mammal Species of the World: A Taxonomic and Geographic Reference (3rd ed.). Johns Hopkins University Press. p. 541. ISBN 978-0-8018-8221-0. OCLC 62265494. 1 2 Breitenmoser, U.; Breitenmoser-Würsten, C.; Lanz, T.; von Arx, M.; Antonevich, A.; Bao, W. & Avgan, B. (2015). "Lynx lynx". IUCN Red List of Threatened Species. Version 2015.3. International Union for Conservation of Nature. ↑ "ELOIS – Eurasian Lynx Online Information System". Kora.ch. Retrieved 2010-12-29. ↑ Page, Amanda; Kirkpatrick, Win; Massam, Marion (January 2008). "RISK ASSESSMENT FOR AUSTRALIA – Eurasian Lynx (Lynx lynx)" (PDF). Government of Western Australia: Department of Agriculture and Food. pp. 1–18. ↑ Nowak, Ronald M (1999). Walker's Mammals of the World. 2. JHU Press. p. 806. ISBN 0-8018-5789-9. ↑ "Eurasian lynx". Peter Jackson. 24 April 1997. Retrieved 2007-05-28. ↑ "Science & Nature – Wildfacts – Eurasian lynx". BBC. 2008-07-25. Retrieved 2010-12-29. 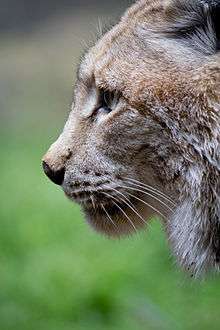 ↑ "San Diego Zoo's Animal Bytes: Lynx". Sandiegozoo.org. Retrieved 2010-12-29. 1 2 3 4 5 6 7 8 Sunquist, Mel; Sunquist, Fiona (2002). Wild cats of the World. Chicago: University of Chicago Press. pp. 164–176. ISBN 0-226-77999-8. ↑ Molinari-Jobin, Anja; Zimmermann, Fridolin; Ryser, Andreas; Breitenmoser-Würsten, Christine; Capt, Simon; Breitenmoser, Urs; Molinari, Paolo; Haller, Heinrich; Eyholzer, Roman (2007). "Variation in diet, prey selectivity and home-range size of Eurasian lynx Lynx lynx in Switzerland" (PDF). Wildlife Biology. 13 (4): 393. doi:10.2981/0909-6396(2007)13[393:VIDPSA]2.0.CO;2. 1 2 3 Diet of Eurasian lynx Lynx lynx in the northern Dinaric Mountains (Slovenia and Croatia). DeepDyve (2011-10-01). Retrieved on 2012-07-27. ↑ Odden, John; Linnell, John D. C.; Andersen, Reidar (2006). "Diet of Eurasian lynx, Lynx lynx, in the boreal forest of southeastern Norway: The relative importance of livestock and hares at low roe deer density". European Journal of Wildlife Research. 52 (4): 237. doi:10.1007/s10344-006-0052-4. ↑ Luigi Boitani (23 November 2003). Wolves: Behavior, Ecology, and Conservation. University of Chicago Press. pp. 265–. ISBN 978-0-226-51696-7. 1 2 "European Lynx Specialists Conference". Cat News (14). Spring 1991. ↑ Johnson, Kirk (November–December 2002). "The Status of Mammalian Carnivores in Turkey". University of Michigan. ↑ Şekercioğlu, Çağan (13 February 2012). "Turkey's First Wildlife Corridor Links Bear, Wolf and Lynx Populations to the Caucasus Forests". National Geographic. 1 2 "Large Carnivore Initiative for Europe Species fact sheet – Lynx lynx". Large Carnivore Initiative for Europe. Retrieved May 28, 2007. ↑ "Status and conservation of the Eurasian lynx (Lynx lynx) in Europe in 2001" (PDF). Coordinated research projects for the conservation and management of carnivores in Switzerland KORA. Retrieved 2009-03-07. ↑ "ELOIS – Populations – Balkan population". Kora.ch. Retrieved 2010-12-29. ↑ "Macedonia Wildcats Fight for Survival", by Konstantin Testorides, Associated Press; in The Washington Post, 4 November 2006. – Retrieved on 30 March 2009. ↑ Macedonian currency: Coins in circulation. National Bank of the Republic of Macedonia. ↑ "Poachers put Balkan lynx on brink of extinction". Terradaily. AFP. 22 February 2009. Retrieved 25 May 2016. ↑ "Action urged to save Balkan lynx". BBC. 3 November 2006. Retrieved May 28, 2007. ↑ Hetherington, David A.; Lord, Tom C.; Jacobi, Roger M. (2005). 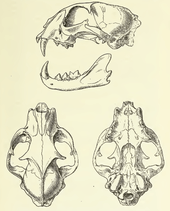 "New evidence for the occurrence of Eurasian lynx (Lynx lynx) in medieval Britain". Journal of Quaternary Science. 21: 3. Bibcode:2006JQS....21....3H. doi:10.1002/jqs.960. 1 2 Hetherington, David (2010). O'Connor, Terry; Sykes, Naomi, eds. Extinctions and invasions: a social history of British fauna. Oxford: Windgather Press. pp. 75–82. ISBN 978-1-905119-31-8. ↑ "Online Etymology Dictionary". Etymonline.com. Retrieved 2010-12-29. ↑ "UK lynx 'could be reintroduced'". BBC. 2008-12-29. Retrieved 2009-05-27. ↑ "Aberdeenshire could be a lynx reintroduction site". BBC. 2015-03-09. Retrieved 2015-03-10. ↑ "Call for landowners to host wild lynx in Wales". BBC. 2015-03-09. Retrieved 2015-03-10. ↑ "Wild Lynx could be reintroduced to Britain". Wired UK. 2015-03-09. Retrieved 10 March 2015. ↑ "Lynx to be reintroduced into wild in Britain after a 1,300-year absence". The Independent. 2015-03-08. Retrieved 10 March 2015. ↑ "Kielder Forest considered for lynx return". bbc.com. BBC. 15 April 2015. Retrieved 19 April 2015. ↑ Hetherington, David; Gorman, Martyn (2007). "Using prey densities to estimate the potential size of reintroduced populations of Eurasian lynx". Biological Conservation. 137 (1): 37–44. doi:10.1016/j.biocon.2007.01.009. ↑ Hetherington, David; MacLeod, Colin; Miller, David; Gorman, Martyn (2008). "A potential habitat network for the Eurasian lynx Lynx lynx in Scotland". Mammal Review. 38 (4): 285–303. doi:10.1111/j.1365-2907.2008.00117.x. ↑ "World of Animals at Plitvice Lakes". Plitvice Lakes National Park World of Animals. Archived from the original on March 5, 2009. ↑ Valdmann, Harri. "Estonia – 3. Size & trend". Eurasian Lynx Online Information System for Europe. Archived from the original on November 22, 2004. Retrieved 2007-05-28. ↑ "RKTL – Ilves". Rktl.fi. 2010-10-14. Archived from the original on July 17, 2011. Retrieved 2010-12-29. ↑ "Metsästäjäliitto on tyytyväinen ilveksen pyyntilupien lisäämiseen | Suomen Metsästäjäliitto – Finlands Jägarförbund r.y". Metsastajaliitto.fi. Retrieved 2010-12-29. ↑ "Lynx". State of the Environment Norway. 19 June 2006. Archived from the original on September 28, 2007. Retrieved 2007-10-06. ↑ "Swedish Environmental Protection Agency & Council For Predator Issues". ↑ Stahl, P.; Vandel, J.-M. (1998). "Distribution of the lynx in the French Alps". Hystrix. 10 (1): 3–15. doi:10.4404/hystrix-10.1-4117. ↑ "Latvia". 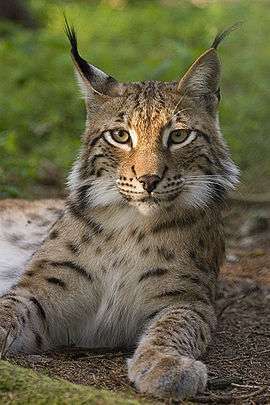 Eurasian Lynx Online Information System for Europe. Retrieved 2008-01-22. ↑ "Lūšis – vienintelė kačių šeimos rūšis Lietuvoje". Ministry of Environment of the Republic of Lithuania. Retrieved 2011-04-29. ↑ "ELOIS – Introduction". 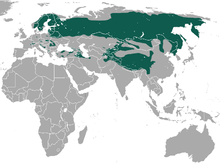 Eurasian Lynx Online Information System for Europe. n.d. Retrieved May 28, 2007. ↑ "Wolf and lynx census". The Mammal Research Institute of the Polish Academy of Sciences. 2008-01-24. Retrieved February 13, 2009. ↑ "Natura 2000 Sites – Rys ostrovid" (in Slovak). State Nature Conservancy SR. n.d. Retrieved 2007-05-28. ↑ "Slovakia (SK)". Eurasian Lynx Online Information System for Europe. n.d. Retrieved 2007-05-28. ↑ (French) Heinz Staffelbach, Manuel des Alpes suisses. Flore, faune, roches et météorologie, Rossolis, 2009 (ISBN 978-2-940365-30-2). Also available in German: Heinz Staffelbach, Handbuch Schweizer Alpen. Pflanzen, Tiere, Gesteine und Wetter, Haupt Verlag, 2008 (ISBN 978-3-258-07638-6). ↑ "Journal of Wildlife Diseases 38" (PDF). Wildlife Disease Association. 2002. Retrieved 2009-06-12. ↑ "Lince Appenninica". Comitato Parchi Italia. 2009. Retrieved 2009-10-04. ↑ I.A. Akimova – Kyiv; Globalconsulting; page. 546, eds. (2009). "Shkvyria M. G., Shevchenko L.S. Lynx // Red book of Ukraine. World of animals/". Wildlife Disease Association. Retrieved 2015-12-13. Deksne, G.; Laakkonen, J.; Näreaho, A.; Jokelainen, P.; Holmala, K.; Kojola, I.; Sukura, A. (2013). "Endoparasites of the Eurasian Lynx (Lynx lynx) in Finland". Journal of Parasitology. 99 (2): 229–234. doi:10.1645/GE-3161.1. PMID 23016871.